Subscribe to comments with RSS or TrackBack to 'Nats first Week of Results and Over-Reactions'. How is it that a guy who has exactly one great season, one 40-HR season and one 100 RBI season, yet demanded to be given the biggest contract in MLB history–a guy who was supposed to be a five tool player yet is a terrible outfielder and has never stolen 20 bases–is considered overrated by his own peers? I dunno–maybe it’s because they get to see him up close? So, the Nats have managed to do what they’ve done during Martinez’s entire tenure, namely stay around .500 because they have too much talent to be a truly bad team. And that’s what I see, a .500 team with a great offense, four great pitchers no depth and a dumpster fire of a manager. when did Harper ever “Demand” anything? Distinguish between his Agent and his personal comments, because one does not imply the other. And, by the way … Harper DID get the biggest contract in MLB history, not because he demanded it but because a team offered it to him. Baseball GMs are entirely rational in the modern game. Why was it that Philadelphia gave him the contract they did? Why were there other contracts on the table for MORE AVV but fewer years? You say Harper is a “terrible” outfielder. Really? Is that entirely based on his 2018 season (which we have previously discussed here and have noted observationally that Harper was “coasting” likely to protect himself against injury in his walk year) and ignores all the previous years where he’s shown that he has one of the best arms in the game and showed positive defensive metrics? You think maybe he’s not given the green light as a middle of the order hitter to get the 20 SBs you want him to get? Maybe he’s just listening to his managers? You say he’s got just one season of value but yet he’s already at 30 WAR with probably 13-15 more seasons … meaning he’s WELL on his way to the hall of fame. I guess players who project as Hall of Famers are somehow over rated? From what I see, he’s constantly listed as “overrated’ because he’s not Trout. Well, nobody’s trout. So i guess everyone else is thus over rated too. I can’t wait to hear his Hall of Fame speech when he retires as one of the top 10 RFs of all time and people are still calling him over rated. Todd, I think you’re way too critical of the way the Nats’ negotiated with Harper and not critical enough of Harper. And I say this thinking (a) Harper is absolutely worth the money the Phillies are paying him for the next 13 years, (b) the Nats could have afforded this price even after signing Corbin, and (c) if I had to choose between a Harper extension and a Rendon extension, I pick Harper because he’s a better hitter and younger. But let’s be clear: the Nats made Harper an offer in September and he did not negotiate. He made no counter-offer. It’s clear that he wanted to see what offers were out there, and the Nats’ offer didn’t blow him out of the water. He was asking the Nats to negotiate against themselves. You make a lot of the deferred money in his deal, but we don’t have reliable information about it. We don’t know how much was deferred and for how long. The details matter enormously if you’re going to do a NPV calculation. And I’m certain the deferrals were negotiable – if Harper wanted to negotiate. It was only AFTER the blue blood franchises made it clear that they weren’t in on Harper that he decided he wanted to return to Washington. The Nats’ second offer was clearly a low-ball offer – “you say you want to come back here – how much is it worth it to you.” I don’t blame Harper for spurning this deal, nor do I blame him for signing with Philly for the most money (I do, however, blame him for choosing Philly over a similar deal from the Giants because I simply cannot understand how a living breathing human being in this world would prefer to spend 13 years in Philadelphia rather than San Francisco, but to each his own, I suppose). I don’t really see a bad actor in this whole situation. 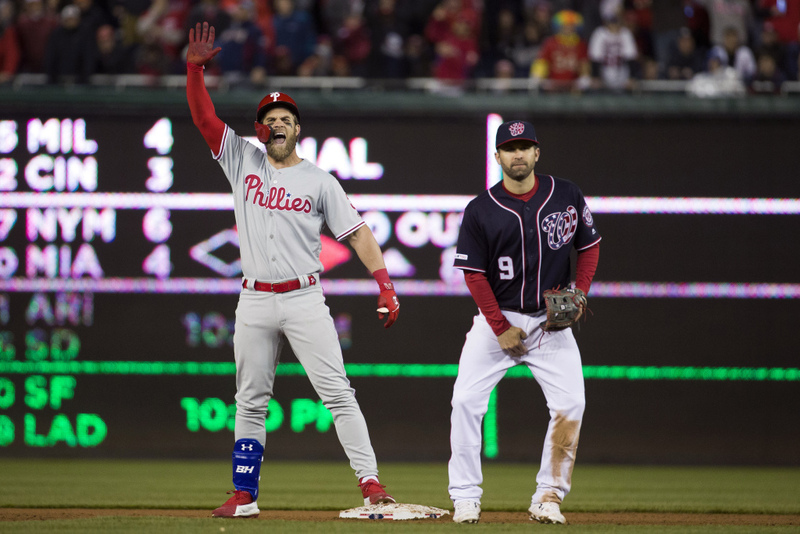 If Harper knew in September 2018 what he knows now – the best offers were from the Giants and the Phillies – he would negotiate seriously with the Nats and would have ended up somewhere close to what he got from the Phillies with modified deferrals. And the reason people think Harper is overrated and DC fans have found it easy to turn on him is because he’s flashy, brash, and arrogant. He’s always been those things. That doesn’t make him a bad guy; indeed, he was nothing but a good citizen when he lived here. But it does make him easy to hate. Todd, slow your role there. At Harper’s present pace he would not make the hall. Take out that one season (2015) and he hasn’t a prayer. Right now he is Roy Sievers, Rocky Colavito, Frank Howard…who walks a lot. He’s had zero transcendent seasons. Mickey Mantle, Willie Mays, Ken Griffey Jr, even Ryan Howard had several transcendent seasons (and nobody’s touting Howard for the Hall). Harper is a below average fielder with a great arm that couldn’t hit a cutoff man if he tried. (Okay a little hyperbole, but you get the point.) Harper is a good to very good hitter. He is not a great player and there’s a big difference. But he is a media darling. He may become a transcendent hitter. The cozy confines of Philly make that possible. It’s also possible the players that vote him overrated may know something about baseball (they don’t vote Trout as overrated)l.
Come on, Harper’s 2015 season was a better hitting season (by WRC+) than Griffey or Mays ever had. It is the best hitting season any baseball player who is not Barry Bonds has had this century. This is transecendence. It’s also an outlier he hasn’t come close to matching (although 2017 was another great season, if not transcendent – not to mention almost as good as Ryan Howard’s single best season, also by WRC+). I’m with Derek here. It’s important to remember that almost everything Harper said about the negotiations were complete lies. He was pretty shocked when the blue bloods didn’t offer him what he wanted. As for the deferred money, I’m reminded when Latrell Sprewell was offered $28 million to play for the Knicks he said it wasn’t enough to feed his family. I agree that the HOF projection is premature, because it assumes too many factors. FWIW, the stat folks at FiveThirtyEight posted an interesting piece about Harper. It’s also conjecture, but a very very read. Very *good* read, not very very. Very very sorry about the typo. Love the Dozier crotch grab in the photo above. Probably not intentional, but perfect nevertheless. Also, his bowlegged stance in that photo is very reminiscent of Danny the K. Now we have Dozie the K . . . Even though they were only two games out of 162, Wed. and Thurs. felt huge psychologically. You feel a lot better about your situation at 3-3 rather than 1-5 (just ask the Cubs, who are 1-6). Thursday was particularly good because they had a clean slate and beat Thor in a game where he gave up only one hit. The only truly bad thing thus far is the Turner injury, compounded by the Nats’ stubbornness in starting Difo instead of bring up Kieboom. They sank like a rock last year while starting guys like Difo and Severino. The bullpen? We’ll see. Those things can blow hot and cold. I think Rosenthal will “find himself” and be fine, as he’s still hitting 100 mph. Sipp and Grace have both gotten some big outs, and Miller looks like the #2 guy in the ‘pen right now, which will be even more significant if/when Rosey and Barraclough figure things out. All of that said, they can only afford to wait a couple of more weeks on the ‘pen before they have to make a couple of moves if things don’t improve. I’m really, really, really tired of talking about #3. I’ll just say that as of now, no, overall, he isn’t on a HOF pace. He certainly has the talent to get there, but he’s only topped 30 HRs twice in seven seasons. Currently, he’s on pace to be one of those borderline guys who gets close to 500 HRs but doesn’t particularly stand out for anything, more of a backdoor-ballot type than a first-ballot one. You’re right–guess I’m just a spoil sport from all those games I sat there at Nats Park watching that mope throw to the wrong base, jog out ground balls, swing wildly and strike out when the team only needed a base hit, constantly bark at the umps, hit most of his HRs when the team was either up or down by five runs, almost never get a key hit to win a game, and was reportedly a terrible teammate, which I can well imagine given how he threw Wieters under the bus at the AS game last year and made EVERYTHING about him all the friggin’ time. Your arguments are all based on stats that have nothing to do with the human aspect of the game. Well, his peers collectively think he’s an overrated little punk, so I guess I’ll just have to defer to their judgement since I am obviously biased. And another bullpen meltdown on Saturday . . . In partial fairness, Miller struck out Cano. There have been a number of bad ball/strike calls that have contributed to the meltdowns. But they’ve still got to do better than melt down. It’s been crazy. I haven’t been able to watch any games until yesterday, believe it or not. Turned it on in the 8th to see Difo’s Home run, then the bottom of the 8th. Just one of those stretches where if it can go wrong, it will. Usually ends. With a panic trade, although sometimes the manager can snap it with something creative. DMart isn’t impressing me that way. For everyone who says that “Bryce Harper is a poor fielder” I provide this link to his advanced defensive stats. by and large, these stats all show the same thng: he was god-awful in 2018, he was also sub-standard in 2015. Every other season he’s put up not only positive defensive numbers, but in some cases literally equivalent figures to the gold glove winner. Across the board his stats plummeted in 2018. That does not make him a BAD FIELDER. It means he had a bad season. You don’t just wake up and suddenly forget how to play RF. Why was he so bad in 2018? I don’t know. Was he coasting in his walk year? maybe. Did he not agree with the manager change and was disillusioned the whole season? who knows. Was he consciously trying to be bad? I doubt it. Nonetheless, the stats don’t lie. And they also show he’s already contributing positively at the DRS level (which is kind of an additive stat) for the Phillies. But I just don’t buy this narrative that he’s suddenly a bad fielder. In 2014 he posted a -6.0 UZR/150 and -12 DRS. So according to those stats he’s pretty substandard. He also posted negative figures in 2017 mostly across the board. Yet the Narrative is that he’s a fantastic center fielder. Well, do you want narrative-driven arguments or stat-based arguments? Do you want to say, “well I saw Mike Trout make a fantastic play so there fore he’s awesome” or do you want some sort of human-bias eliminating system to determine whats what? One last thing on Harper. You CAN’T just take out his 2015. Because it happened. Because all the skills that led to 2015 are still there. Because Harper has had and continues to have portions of seasons since that match his 2015 output, and probably would have achieved something close to it were it not for a slew of in-season injuries that robbed him of months at a time. And when he puts it all together again for a full season and puts up another one of these seasons (you know, since the dude is only 26 and probably has 5 more years at peak) people are probably STILL going to say he’s over-rated. Ask yourself this: what exactly does Harper have to achieve in his career to have you NOT think he’s over-rated?? If he wins a 2nd MVP? a 3rd? If he hits 600 career homers as he’s currently projected to do and likely eclipses thanks to the band-box he’s now hitting in? Or will he perpetually be considered over-rated because he’s not one of the best 10 baseball players to ever live? In what arbitrary stat devised universe are you living in claim Harper had the better year. Plus Griffey had six years of comparable output. Harper one. Plus Griffey may have been the greatest defensive outfielder to ever play the game. Can’t breath that notion about Harper. I get you like Harper but please. Todd you are assuming that Harper will hit 150 home runs from his 34th birthday forward to reach six hundred. Injuries are part of the game. Griffey hit 162 from age 34 on playing on one leg. If he doesn’t get injured he’s the all time homer leader by his trend lines. Harper is a 30 homer, 90 rbi guy as we speak. He may get better, he may be what his stats say he is. There are a lot of those guys in the league, past and present. Most haven’t sniffed the HOF. I’m A LOT more interested in someone — ANYONE! — who can get people out in the 8th inning than I am this Harper person. I’ve moved on. Griffey’s 1997 in the context of the season was no where near as good as Harper’s. 165 OPS+ versus Harper’s 198 OPS+ in 2015. Griffey’s 9.1 bWAR/9.0 fWAR for the season versus Harper’s 10.0 bWAR/9.3 fWAR figures. Griffey’s 154 wrc+ versus Harper’s 197 figure. In some ways you can claim from these stats that Harper’s season was probably 25% better in terms of overall run production. As for predictions on Harper’s HR production; he’s playing in his age 26 season. IF you don’t think he can hit 150 homers in the next 8 seasons (that’s less than 20 a season) then … well come on. Even with all his injuries so far in his career he’s only failed to eclipse 20 in one season … and this cannot be more emphasized, but he’s now playing half his games in a stadium where historically he’s averaged a homer ever 3.5 games (well below his per-game homer rate at Nats park). Philly is a huge left handed power hitters park, 4th best overall homer park in the league in 2018, and situated so that the wind frequenly blows out to right (the park sits basically on a N-S axis so wind generally blows L to R). KW well then you’re in luck, b/c the team is “on” to Bud Norris! The savior! Still not quite “getting” the bullpen usage, nor Martinez’ obsession with letting Scherzer bat ahead of innings where he’s getting yanked. Its like he learned nothing last year. I may be the only one in the Natosphere, but I haven’t given up on Rosenthal. We just have to hope that this is game rust and not the second coming of Ankiel (as a pitcher). He’s still in the high 90s. He just can’t get hitters off his heater because he’s no threat to throw his secondary pitches when he’s perpetually behind in the count. Yep, #3 did what he always does, spun himself into the ground with the game on the line. Forget him. It’s #22 you should be tracking as your future Hall of Famer. And #16 is ready, no doubt. Remember all that crap about him sharing the position with Taylor? Um, no. Also, Doolittle is a hell of a closer. Just got to keep him healthy. Also, the Nats have now scored ELEVEN runs on Nola in two games. Taylor may be more a threat to Eaton’s job. I think Eaton will bounce back, but an argument could certainly be made right now for moving him down in the lineup and putting Robles at leadoff. Robles at #1 and Kendrick at #2. It’s a killer having Eaton and Dozier at the top of the lineup right now. Eaton has a long track record of being a good hitter, including being a good hitter last year. Taylor has a long track record of … not being a good hitter. I’d need almost an entire season of poor performance from Eaton before I’d expect Taylor to hit better than him. So, for me, Eaton’s leash is very very long. I don’t mind Taylor getting a start over Eaton here and there against a lefty or to give one of the other two a day off. But anything more than that is a mistake. Dozier is a different story for a few reasons: (1) his track record isn’t as consistently good as Eaton’s; (2) he was not a good hitter last year; and (3) his putative replacement – Howie Kendrick – is a much better hitter than Michael A. Taylor. So long as the OF remains healthy and Kendrick is not needed to spot start or play everyday out there, I think he and Dozier should split time. Dozier has a higher ceiling than Howie (both as a hitter and as a defender), but Howie seems like a better hitter right now and a reasonable bet to be a better hitter going forward. As for the lineup order, there are cases to be made for moving Eaton and Dozier down and Robles up. For similar reasons, the case for moving Eaton down is far worse (IMO) than the case for moving Dozier down. I don’t think Dozier profiles as a top of the order guy even if he’s hitting well. As a power over contact guy with ok but not great patience and ok but not great speed, he seems like a bottom-third of the order guy. I’d certainly be ok with flipping Robles and Dozier in the order. On the other hand, I sort of like Robles in the 9 spot as a second leadoff guy, but if he keeps hitting like this, I would like him in pretty much any spot in the order. Yes. Eaton is an important part of this team moving forward. Taylor, um, hasn’t been missed. I’m still trying to figure out what they’ve got in Dozier. He’s solid defensively, still scuffling offensively. He strikes me as a savvy player. I wonder whether he’s pressing a bit more batting higher in the lineup. Good showing from Ross on Tuesday as a semi-long-man. Not sure why they didn’t have him doing that from the start. He stopped the bleeding and let the rest of the team get back on their feet. I wasn’t serious about Taylor replacing Eaton. But I for sure don’t want Robles getting minimized. Eaton looks off early though. A lot of bad swings and lacking any xbh pop. Why would Davey keep batting Dozier 2nd? Why can’t we ever learn to drop severe slumpers in our lineup? Their paychecks are still clearing. That’s all we owe them. They should have to earn the batting spots. The reason you shouldn’t drop slumpers in the lineup is that you cannot predict when slumps start and stop. By messing around with batting order based on small samples of recent performance – “his swing looks messed up right now” – you risk (a) the slumper coming out of his slump in a less advantageous batting position and (b) the guy on a hot streak replacing the slumper regressing to the mean and performing like we should expect him to perform, only this time in a more significant batting position. If a coin flips heads 8 times in a row, the probability that it will flip heads on the 9th flip is and always will be 50%. The best predictor of Eaton’s future performance – even small samples of future performance – is what the projection systems predict for him. The problem with Dozier hitting second is the decision to hit him there in the first place – there are other better hitters on the team who should hit there – not the decision to keep hitting him second despite his current poor performance. I say all this with the enormous caveat that lineup construction doesn’t matter all that much in the grand scheme of things. I think you can predict length of slumps. Harper’s last months… Zimm usually 2 -3 weeks. Dozier maybe seasons…. In any case.. they generally don’t last just a day or two. No you can’t. And if you could, might I suggest moving to Vegas to cash in on your ability to predict. When is Eaton’s slump going to end? How do you know once it has ended? If you move him down today and he hits two homers, do you move him back up tomorrow? And what separates a “slump” – when you’d move the hitter down in the order – from a “rough patch” – when you’d leave him in his spot in the order. One week of poor performance? Ten days? Dozier is middling at best with OBP and was below average last year, plus he strikes out a good bit, neither of which is ideal near the top of the order. He does walk a fair amount, though, and he’s usually in double digits in steals. The overriding point right now, though, is that they don’t have a lot of other options unless they want to move Rendon or Soto up (a la Maddon when he was batting Bryant second in the order). You’re not going to bat Difo or one of the catchers at #2. Zim might be an option if people could get past the antiquated thinking that he’s “an RBI guy.” Robles is certainly an option, although folks seem to be liking the AL thing of batting him #9. At least Nat life in general looks a lot better after the last game and a half in Philly. I’ve been saying for weeks that the Phils don’t have enough pitching, starters or relievers. Pivetta is their #3. The Phillies definitely do not have enough pitching. If I was a fan of theirs, I would be livid at them for not signing Kuechel (which, of course, they still can do). Arrieta has 9 BB and 7 K in his first 13 innings. That is … not good. Nola hasn’t pitched well either, but unlike Arrieta, I expect him to turn it around. Having said that, their lineup is really good. It’s an interesting collection of non-Marlins teams in the NL East. All have talent and clear strengths. But all have clear weaknesses as well. I suspect injuries are going to have a lot to do with how it shakes out. Bud Norris deal fell though. Nats thought he was at least a month away from game-ready, which isn’t what they need. Yes, the Phils have tried to do rotation-on-the-cheap, presumably to leave them extra “stupid money,” but it was a stupid move. They didn’t even have to spend big. They got dominated on Wednesday night by a guy who cost the Nats virtually nothing. Word was that Morton wanted to get back to that area, and he took a very reasonable deal from the (1st place) Rays. Keuchel reportedly priced himself out of a lot of markets right off the bat, though. Plus if I were the Phils, I’d be worried about taking on another guy who looks to be on a very similar regression path as Arrieta. One NL East note: the Braves and Mets have already gotten to beat up on the Fish, but the Nats and Phils haven’t. So current records could be a little deceiving. Significant NL East injuries thus far: Turner for the Nats is the biggest, as Folty and Gausman appear ready to come back for the Braves. Frazier is about to come back with the Mets. Hard to count Cespedes since the Mets had a long time to plan for his absence. Gomes/Suzuki – Are pitchers still adjusting to their game calling? Still, the difference between them and Wieters/Severino need not be discussed. Zimmerman/Adams – The original face of the franchise has been a class act since late 2005… still, his career is at a point where the peaks in production are ever more far and between; not to talk about his fielding limitations. In an ever more competitive NL East, if we want to be on top, I’d rather have Adams starting versus as many RHP as possible. Dozier/Kendrick – Hoping for this past series to light a fire in Dozier’s offensive capabilities. Is he a # 2 hitter in Turner’s absence? Not sold on that yet. Kendrick a most unexpected surprise to have him playing and raking. Our super-sub without a doubt. Turner/Difo – Pity that Turner was hurt. He was truly raking and playing his game (power and speed). How long will it take for him to overcome the lingering effect and limitations that are inevitable with this sort of injury? Difo? I think we might have to do better looking forward. His hitting and baserunning gaffes hurt the team too often. Rendon – MVP. Will Rizzo/the Lerner’s/Boras agree to an extension? Ever more it is evident that he IS a more valuable player to this team than Harper ever was (and Harper was quite good). As much as I like Kieboom as a great prospect, he is no near-term substitute for Rendon. Soto/Robles – The new faces of the franchise. Should Robles continue in thr 9th spot? Or is his blazing speed best utilized as a leadoff hitter? How would Soto do with better protection behind him in the batting order? Shouldn’t DM consider batting Soto 3rd and Rendón 4th? Eaton – Amazingly, ever more it sees his deal was not a Chicago slam dunk win; yet, will we ever see the real Eaton? To those that are able to watch the team live or on tv… Is he playing a capable RF? How’s his baserunning? I’m concerned. Taylor – Too early to tell… but will his new stance pay dividends? Stevenson – Might be unfair to judge him so quickly, particularly given he’s always been a slow starter in the Minors; still, is there truly hope for more? Starters – Not the best start as a group, yet one can clearly see them as an area of strength for this team. Scherzer is Scherzer. Strasburg is Strasburg, always teasing us for more, but then giving some cause for concern (will he be as good with the diminished velo)? Corbin is not elite, but quite impressed with him so far. Sánchez, likewise, and Hellickson too. Bullpen – Crossing fingers that the nightmarish start is over. Doolittle is great, though, should we be concerned with the diminished velo? Rosenthal… hard to judge at this moment. Obviously, still reason for concern. Barraclough… not the 2018 1st half version, but a potentially useful bullpen piece. What about his diminshed velo? Reason for concern? Sipp… too early, but undoubtedly a useful member of our bullpen. Grace… the usual Grace. Serviceable, though nothing extraordinary. Miller… will he ever be anything close to what he was during his first month as a Nat? Or is he average at most? Suero… right-handed version of Grace? Ross… too early to tell, though the potential for a key BP role is there. Still, remain quite optimistic about this team. Hopefully, DM grows into his role even more. Difo is batting .207 with an OPS+ of 51. Carter Kieboom is hitting .375 at AAA. I don’t know what they’re waiting on to call him up. The division is too close to play time-clock games. Besides, they can send him back to Fresno after Turner is back . . . unless they need him to take over for Dozier. Agree 100% on Kieboom, plus the added benefit that it would possibly allow for Turner not to be rushed to return to the daily lineup. I’d rarher he returns when his finger has properly healed and feels strong enough. Corbin sure looked “elite” on Friday night. Too bad the bullpen didn’t. The bats didn’t, either. Dozier now at .167, Difo .188, and Zim .205. Kendrick, meanwhile, looks lock in. Time to get him on the field. Agree… Corbin did look elite last night. Still trying to see what kind of pitcher he is and what sort of projection one might be able to make. The team isn’t playing badly, it’s just going to be a dogfight all year. You could argue that there is more upside than downside in the offense and SPs from current performance. But the combination of DMart’s lack of expertise and the current bullpen talent is a bad combination but I dunno what the answer is. Another day, another bullpen loss. Also three days in a row in which the offense generated only three runs in regulation. At least they’ve got Kendrick to plug in for Dozier. Difo is allowed to keep merrily tooling along at .184, though . . . while Carter Kieboom is cranking at .382 at Fresno. It’s asinine not to call him up. And they continue to bat Zim in the five hole while he’s slashing .205/.321/.295. Agree about Difo/Kieboom. This is a self-inflicted wound. If the Nats lose the division race by a game or two, THIS is the cause, not whatever happens in August or September. I want to say not calling up Kieboom now is the single least defensible decision of the Mike Rizzo era. But if they call up Kieboom, they have to send Difo down now that Kendrick is back, right? Is Difo without options? Derek–That’s exactly what I’m saying: the division is too close to play time-clock games right now. Just look at the standings–flip two of their losses to wins and they’d be tied for first place. Instead, they’re in fourth. And don’t give me any “he needs regular playing time” crap. He can play EVERY DAY in the majors. And anyone who can hit two homers into the wind against Verlander isn’t going to have a problem standing in against anyone. Since Difo (incomprehensibly) spent the entire 2018 season with the big club, I think he still has an option left, but don’t quote me on that. Todd has lists of such things. Would they option him, or keep him on the bench as the only SS-capable reserve? I did find it interesting on Sunday that they pinch hit for Difo in the 9th (with Robles getting a hit), leaving them with an interesting choice if the Nats had tied it. As I’ve noted, Dozier played SS the first year he came up, and Rendon got a couple of games there as a rookie as well, so they’ve got a couple of guys who could do it in a pinch. In the hypothetical world where Kieboom is playing SS everyday for the Nats, the question is not whether there is a backup SS on the roster. Currently, as KW points out, they are playing without a real backup SS. Just as they are putting all SS eggs in the Difo basket right now, they could do the same with Kieboom (and have Rendon or Dozier back him up in a pinch). The problem is that one of Taylor or Difo would need to be sent down to make room for Kieboom. Kendrick cannot be sent down (nor would you want him to be). I don’t know either’s option status. If calling up Kieboom means exposing Difo to waivers, that’s a decent reason for not calling Kieboom up. It’s probably not persuasive – we need to win games now. But it’s at least plausible. The Nats optioned Difo in ’15, ’16, and ’17, so by my count, he’s out of options. If DFA’d, though, there’s a good chance a slap-hitting middle infielder hitting .184 would pass through waivers and could be outrighted. The Nats had Difo experiment in CF in the spring, and Taylor was drafted as a SS, for whatever any of that is worth. Hmmm. What happens when Turner comes back? The team hasn’t really had to confront this issue because Kendrick was hurt at the beginning of the year. The only options I see are to go with 7 relievers (instead of the 8 that are currently on the 25-man) or DFA Difo. My instinct says that not having a backup infielder that can actually play SS is a mistake. Rendon or Dozier could probably do it for part of a game if someone gets hurt, or a single game if the team needs time for someone to travel. But neither is a long-term SS. So, I suspect, the team is planning to go with a 7-man bullpen when Trea returns. Which raises the question WHY WON’T THEY DO THAT NOW??? I like Joe Ross. I think it’s a good idea to experiment with him in the bullpen. But he’s thrown 2.1 innings in MLB. Wilmer Difo has had 43 ABs since Turner got hurt. Do we really think Joe Ross’s contribution is more valuable than the delta between Difo (who has negative WAR) and Kieboom? I certainly don’t. So it seems to me that Difo could get optioned w/o losing him. As far as why Kieboom hasn’t been called up yet … most of the scouting reports i’ve read on him indicate he isn’t defensively capable of playing SS at the major league level. But he continues to play SS primarily at Fresno (couple of starts at 2B). Is this entirely about player control (when Turner got hurt it was too early to call him up)? Well, we may be getting an answer; 4/16 is riiiight around the time that ensures an additional year of control. Maybe we’ll get an answer within the next couple of days.